Writable Paints: 5 Fun ways to use them! 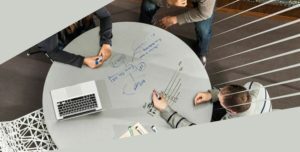 Writable paints are becoming more popular than ever. Paints that turn a wall into a writable surface have been flooding the marketplace over the last few years. So much so that just using them on a conventional wall has become too boring for some people, and they’ve really let their creativity run. Below are 5 of our favourite ways that we have seen to use Whiteboard or Chalkboard Paints. This one isn’t necessarily a new idea, but it is such an effective one. 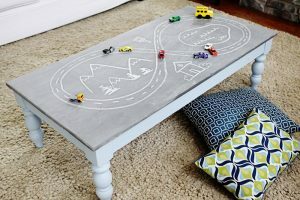 Children love drawing on tables, and using a writable paint lets them do this! Below is an example of a Chalkboard table, which is great, and gives a child the freedom to create whatever comes into their minds. If you want to leave a reminder or simple a nice message to your family, I would recommend getting a large old photo frame. Once you’ve found your old photo frame, remove the glass and paint the board. Once the board is dry, your own unique vintage chalk board will be ready to use. These can also be used on children’s bedrooms as a name display. This idea has been made public recently through schools and businesses creating working space that allows people to write directly onto the wall. However, if you have young children or run a nursery, adding a white board wall into their bedrooms/play area will allow the children’s creativity to constantly flow. Children don’t have to spend everyday in the same room, one day they could draw space to the next a farm yard. 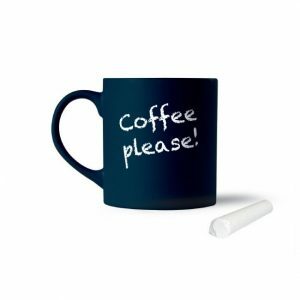 Waking up your other half on a cold Monday morning for work always feels better with a cup of coffee, but to make it even more personal you can now use Chalkboard paint on mugs (decorative purposes) and leave a message that will help your other half wake up for the rest of the day. Or if you really wanted, you could always ask for another drink. This is also a great way of making personalised gifts for someone. If your’re thinking of other smaller items, you can also use the paint of jewellery boxes, lunch boxes and also anywhere you would like to leave a note. Just like the chalkboard paint we suggest for offices, lectures and even libraries the whiteboard paint. The reason is simple, its great to brainstorm new ideas and get everyone on the table involved. Imagine being at university working in a group project, you can have fun whilst revising, This is also good for staff meetings, so people can write notes and afterwards compare with each other. Writable paints are not just for children but for adults too! 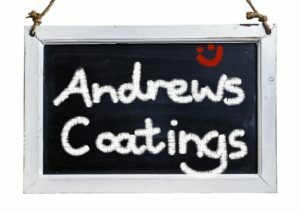 Thank you for reading, if you need any advice or help please contact us on 01902 710057 or send us an email info@andrewscoatings.co.uk.